On Friday I delivered the Make do and Mend workshop to children and families visiting the Museum of East Anglian Life. The workshop took place in the dining room of Abbots hall where I spread out a range of fabric scraps including army cloth and camouflage on the dining table alongside my old Singer sewing machine. Children chose fabrics, cut out triangles with pinking shears and made their own strip of bunting to take home, all of them were using a sewing machine for the first time and several families said they felt inspired to do more sewing at home! The youngest child I worked with was a remarkably focused little girl only three years old, she wasn’t quite big enough to operate the sewing machine by herself but had a lot of fun turning the handle while I guided the cloth. It was lovely to see my installation in a museum setting where it seems at home as part history part art, part fact part imagination and as a set of objects which like historical artefacts lead and link to stories. 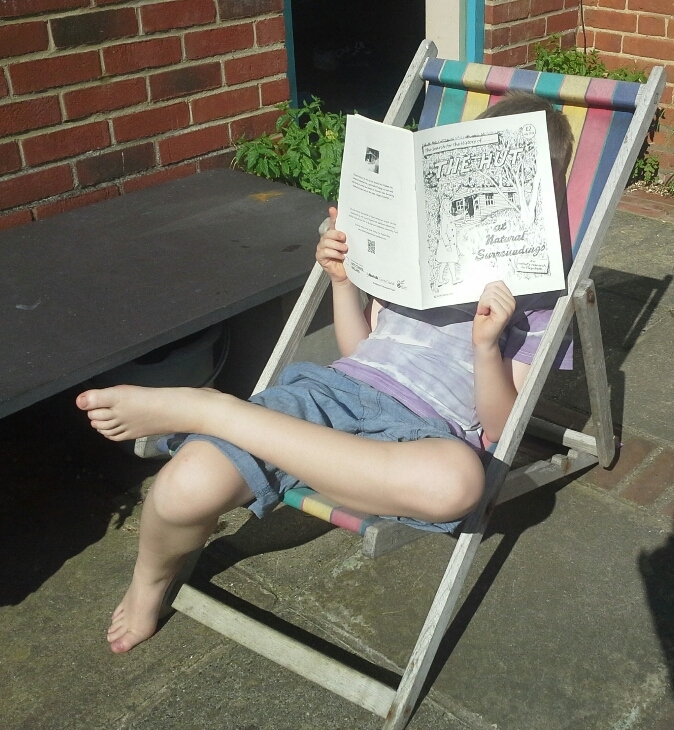 Lisa found a small wooden table and chair so we could invite the viewer to sit and read the comic. The installation will be shown at The Museum of East Anglian Life throughout the autumn with some accompanying workshops taking place during half term week. The following workshops will be free with a museum admission ticket but booking is essential so let me know if you’d like to come! 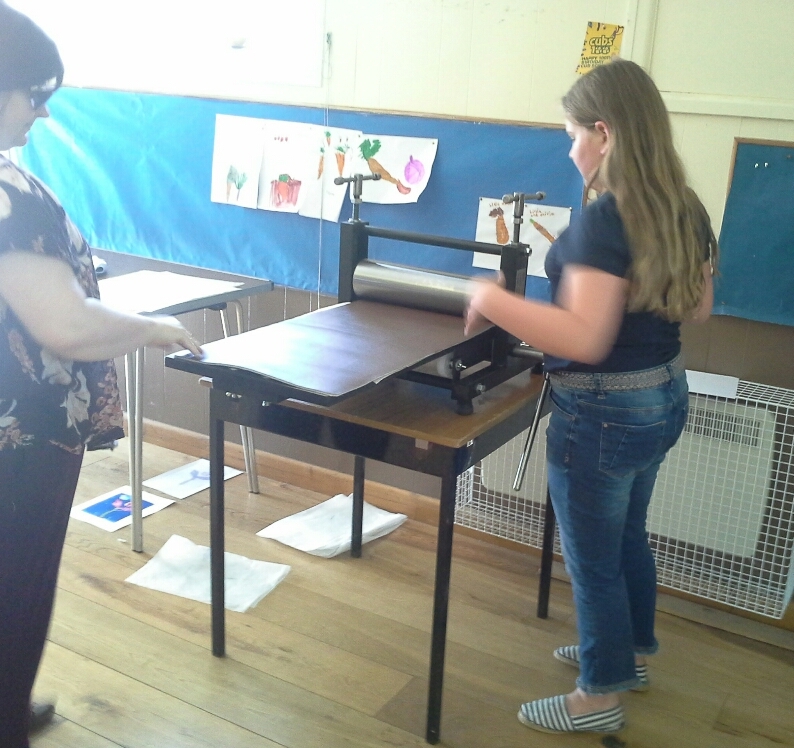 A workshop for all ages using an etching press and mono print techniques to capture the texture of everyday fabrics and create a series of beautiful prints. Bring old fabrics with interesting textures to include in your prints. A workshop for all ages using an etching press and making collograph plates with a range of scrap packaging to create a series of beautiful prints inspired by everyday life. Bring fabric, card or packaging with an interesting texture. A workshop for all ages. Inspired by the values of the past when clothes where mended and scraps of fabric utilised for new purposes using an old hand-sewing machine to make bunting and learn simple sewing and mending techniques. Bring old clothes to cut up or items you would like to mend or adjust. 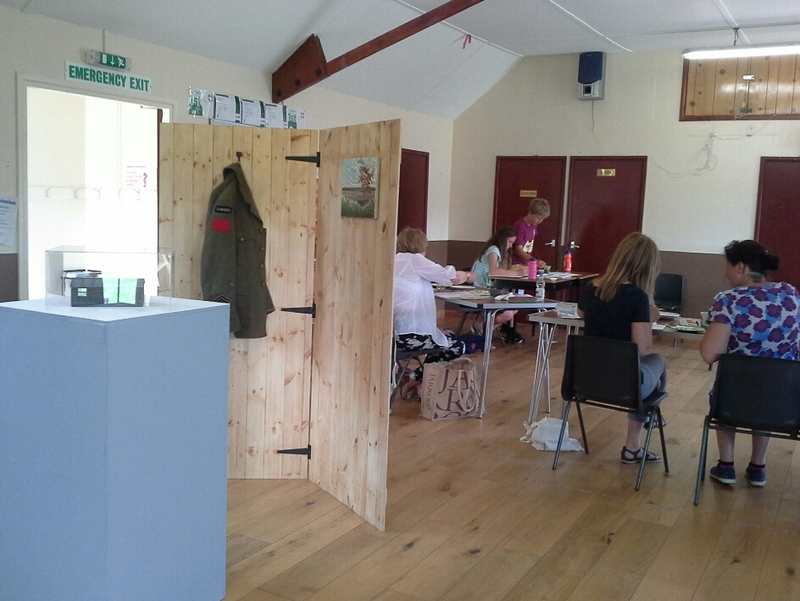 The last of the Norfolk workshops took place in the hut itself on a couple of surprisingly hot September days. Participants of Chloe Mandy’s landscape painting workshop had no shortage of inspiration in the beautiful setting of Natural surroundings in the Glaven valley and created some evocative paintings and drawings. The printmaking workshop was peaceful and focused and it was lovely to see the hut emerging again in some of the images. The celebration event on the 17th September was a lovely way to end the Norfolk part of the project with a gathering of friends and project participants and some great conversations about history, sewing machines and huts among other things! The jacket in my installation makes reference to the jacket, now lost that was still in the hut when it was first moved to Natural Surroundings. 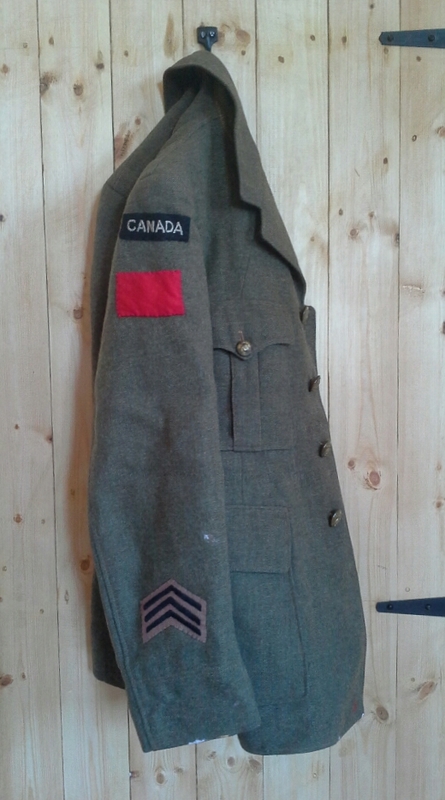 The rumour that the hut had been used by Canadians and the discovery of the artist’s notes (read the comic for more information) led me to imagine a Canadian artist officer hanging up his jacket at the end of the war. Conscription during WW2 meant that soldiers came from all walks of life and I was interested in the contrast between the creative activity of painting and the inherently destructive activities of war which the imagined Canadian officer seemed to represent. The hut with it’s history as part of war and it’s present role in the peace and tranquillity of a wildlife garden also seemed to represent both growth and destruction. I wanted to recreate the jacket as a way to hint at the possibility of a Canadian officer painter who we can only imagine and to represent him in a way that communicated these contrasting roles. Clothes have been used widely in contemporary as powerful metaphors for the body or presence of a person stimulating the memory or imagination to communicate a sense of intimacy and physical presence. I sourced an original WW2 Canadian jacket but created hand sewn insignia myself which brought the jacket, a real historical object into the realm of the imagined. A few small spots of oil paint on the jacket help to identify it as the artist officer’s jacket. The theme of the unknown solider has been explored in art and literature and has become a symbol of sacrifice and loss in war making particular reference to the ordinary soldier and many different countries have an official Tomb of the Unknown Soldier. The theme also links with the inevitable solitude of death that we will all ultimately face and perhaps there is something comforting for ourselves when we feel compassion for those who are lost and forgotten. Tom Thompson the Canadian landscape artist who influenced a generation of artist’s including the Canadian war artists was unable to join up in WW1 because of health problems. His mysterious death alone on a lake in the Canadian wilderness he’d loved and painted so powerfully also connects with the idea of the unknown soldier, facing those last moments of life alone. The Canadian war artists would have been aware of Thompson’s work and his untimely death. 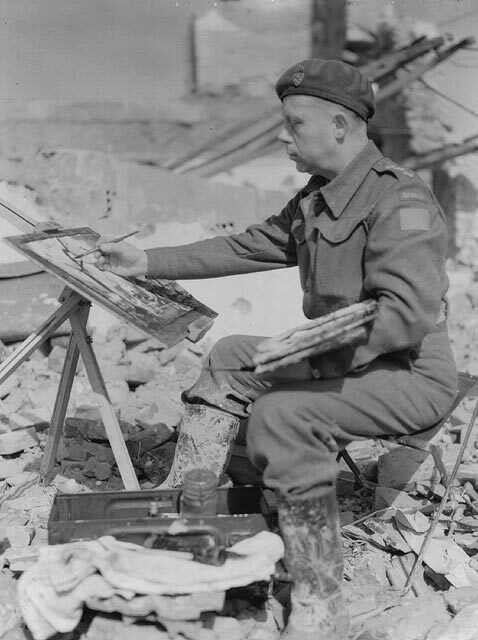 Here’s a photo of Charles Comfort one of the official Canadian war artists during WW2 painting while stationed in Italy. He had spent time with the Group of Seven and became a landscape painter after drawing inspiration and influence from them. ‘The search for the history of the hut at Natural Surroundings’ is a documentation of my research process for The Hut project and tells the story of my investigation into the hut’s history and the organisations and people who helped me along the way. Art documentation can be dry and I felt a straight forward presentation wouldn’t do justice to the rich experience of the research process. 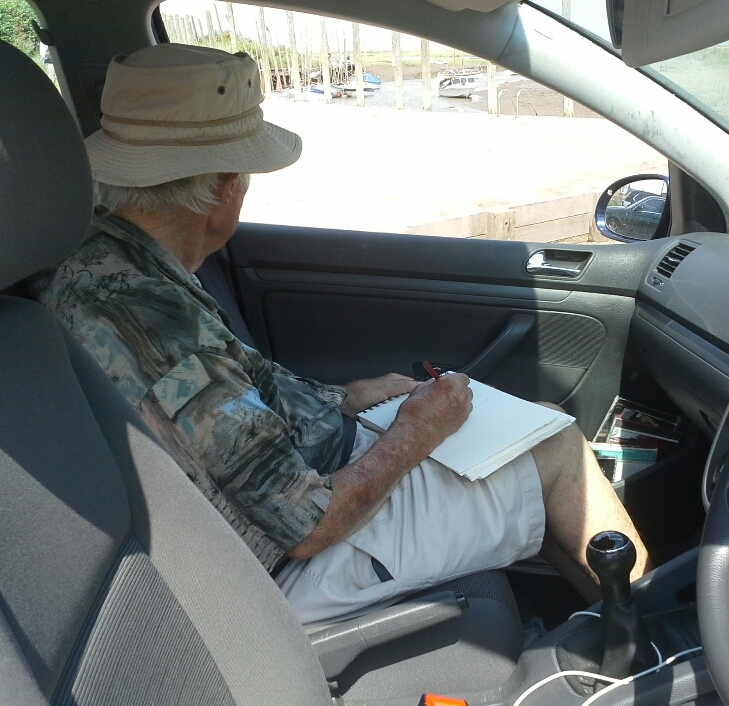 Boris Groys writes about a shift within the art world away from the art product and towards documentation of art activity where documentation can be made in any media. However he points out that, “documentation is not art, it merely refers to art”. Through the use of documentation art can be seen to be a part of life rather than a means of describing or signifying aspects of life. I decided to use the comic form because there was a kind of drama to the sequence of clues, rumours, co-incidences and surprises which unfolded within the ordinariness of small north norfolk villages. I was influenced by the comics I read as a child; the adventures of Tintin and 1970s girl comics such as Jinty and Bunty but my comic sticks to the narrative of real life events which gives it an inconclusive open-endedness. I wanted to show some of the ordinariness of the work of an artist; not a wrestle with paint or clay or even the enactment of an art performance or ‘happening’ but some everyday interactions in the world with an artistic purpose. My decision to characterise myself as Elizabeth, the intrepid art researcher was a way of stepping back, gaining objectivity and remaining partially in the shadows as the artist/author. However in doing this I have at the same time portrayed myself as the central character. There is an inherent paradox in art making; creating an objectification of the world inevitably includes the subjective, ie the artist’s personal view point. Although the artist enjoys ‘artistic license’, the freedom to control what they show and don’t show it is impossible to eliminate the subjective, the work is always from the artist’s view point. I like the way a comic can show a sequence of images, narrative text, speech and thought bubbles simultaneously because it enabled me to portray my own thought processes and reflections (the artist’s view) at the same time as the external world I was responding to. Although the comic is a collection of drawings it is not in itself an art work but a portrayal of my own art activity taking place and in this it has become a kind of self portrait. There is nothing new in artist’s portraying themselves making art and I am reminded of Picasso’s many images of the artist (himself) at work which show the compelling intensity at play between artist, subject and art work where the artist seems to behold not only a new view of the world they observe but also a new version of them themselves as an active participant in that world. To buy a copy for £2 email me or come to one of the events at Natural Surroundings in September. 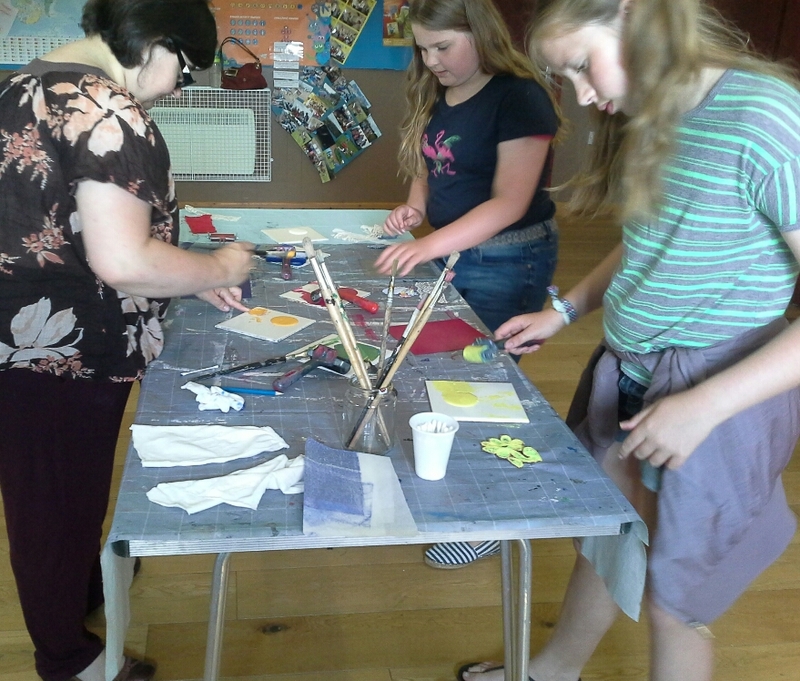 The first wave of workshops for my project took place alongside my installation in Blakeney scout hut in July. The scout hut seemed an unlikely venue for contemporary art and it became a hut containing a project about another hut which was funny but also pointed to the prevalence of huts as multi purpose community venues in the countryside. Its ordinaryness felt in keeping with the project’s themes and as a well used activity space it was perfect for art workshops. I began the workshops with an introductory talk about my intallation. Chloe Mandy’s landscape workshop linked to my painting based on an unknown artist’s notes and participants were asked to create paintings from thier own notes and sketches. 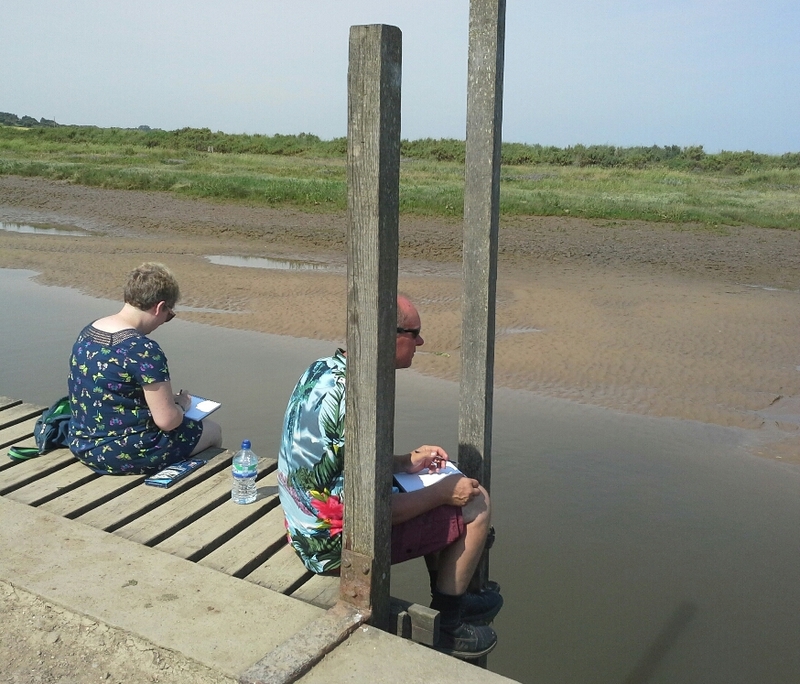 Blakeney harbour was an ideal place for making notes and sketches. During the printmaking workshops children and adults incorporated everyday textiles, scraps of cardboard and packaging into beautiful mono prints and colagraphs. ​I have titled the painting in my installation, ‘The imagined painting of a Canadian officer stationed in Norfolk during WW2’. This wordy title introduces the combination of possible historical circumstances and my own artistic interpretations which led to the painting’s construction. The idea for the painting began with the discovery of an artist’s notes inscribed in pencil in the interior of the hut when I searched it for graffiti or other clues to its past use (read the comic for more about this story!). 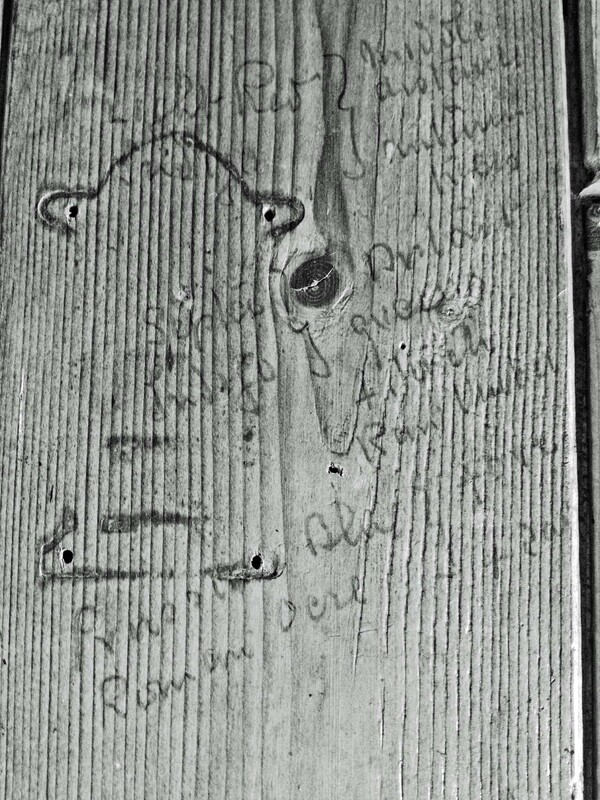 It was such a surprise to find an artist’s notes and seemed a wonderful opportunity to get to know one of the hut’s previous occupants, to see what they might have seen……. Already my own thoughts about the imagined painter influence my interpretation of an illegible phrase into ‘autumn hues’. Perhaps the colours of an English autumn chimed with his nostalgia for home and the famously vibrant colours of the Canadian fall? By photographing the approximate view from the hut’s original site I found a rough structure for my painting but decided to make the old oak tree young again as it may have been 70 years ago. I wanted to draw on painting styles of the period and looked at the paintings of Tom Thompson Canadian landscape painter of the early 20th century who influenced a generation of artists and was the inspiration behind the Group of Seven. It seemed likely to me that a Canadian landscape painter working during WW2 would have drawn influence from Tom Thompson I stuck to the colours mentioned in the notes which made an unusual palette but when I mixed the combinations indicated in the notes a set of very earthy colours emerged, very like the Norfolk landscape. Making a painting in this way was quite new for me and it felt liberating for the painting to lose the weighty necessity to be a work of art instead being just one element within a larger conceptual art project. It felt good to have a reason to paint other than for the sake of painting itself, I found an article by Jan Verwoert ‘Why are conceptual artists painting again? Because they think its a good idea’ which describes a climate of art making within the ‘Post Medium Condition’ a phrase coined by Rosalind Kraus to describe a way of making art which moves beyond an artistic endeavour to explore the bounds of one medium. It was immensely enjoyable to begin the painting after all the preparation feeling the gorgeous softness of the paint in those first marks on the canvas. It didn’t take long though for the pleasure to degenerate into a familiar angst ridden struggle within the four corners of a canvas which made me glad that painting isn’t the only thing I do. This scale model of the hut at Natural Surroundings plays a vital role in my installation. I had wanted to find a way to take the hut on tour to other locations and explored various ideas about how to do this before deciding on a model. I wanted to draw the hut out of its environment to get a better look at it. I was interested in the way the hut had seemed to become camouflaged, a theme which relates to its military past and the natural environment it now inhabits. On reading around the theme of camouflage I came across the book Camouflage by Neil Leach. Leach explores the theme in relation to architectural and psychological theory and talks about the problems inherent in assimilation; the human urge to assimilate results in loss of self or identity. It seemed to me that by assimilating into the landscape and becoming part of things now the hut had almost lost its identity and history. I wanted to show the hut as I see it; as a space of potential, not just for future use but for imagining its past use; therefore the model remains unfurnished although the detailed representation of the wood panelled interior enables the viewer to imagine how it might feel to be inside. The model itself has exceeded my expectations with its beautiful detail and authenticity to the original. Looking at the close up photograph of one of the windows it’s hard to see that it’s a model at all.